I suspect there are two main categories of readers of this blog. People who know me personally and read this blog as a stop gap check of my pulse before the next cup of tea together (It's better than a phone call. I loathe the phone.) and people who share my love of children's books and may also blog about them. Of course if you've stumbled here in search of genuine recommendations then that's wonderful and I hope you'll find what you need- you are part of a small sub-category number three. If you've just come to recommend a stockist of cheap bed frames in Glasgow to me (which seems to be happening with bizarre frequency) then fine, but probably you know, not brilliant targeting of audience. I have a bed. I'm not in Glasgow. You are my fourth group. Anyway. This post I think, is going to be of most interest to the first and third category of my readers (who knows about the Glaswegian bed enthusiasts?) because the second lot know it too well already. I am shamefully late to the discovery. Hilary Mckay is a wonderful, wonderful writer. The lateness is excusable; I am both too old and my children too young and conceivably too male to have stumbled across her by chance. It's only relatively recently that I have allowed myself to play catch up with all the children's writing I missed during the long years of reading tedious adult fiction. Oh it's been lovely. Anyway Hilary Mckay was a name cropping up in virtual conversations a lot and then I read this fabulous interview with her here and then, almost the next day in fact, I came across three of her Casson family novels second hand in the Oxfam bookshop and THEN, oh my, I was in heaven. Sometimes it can be hard to differentiate my reactions to a book as an adult from what they would have been as a child. It's transparent to me however, that I would have had the same sense of love, and warmth and plain old happiness from opening my first 'Casson' book age 10 as I had age 42. It was that overdue cup of tea with an old friend feeling. They're very, very funny but they're also human and true. Nothing terrible happens in them, she shares with Helen Cresswell an interest in character over plot I think. And you know I like that now and I liked that then too. There's been a lot of debate in the media over the last year or so about the Dark Themes that have dominated children's literature (or at least prize-winning children's literature) over the last year or so and whether that's a Good Thing or Not a Good Thing. I'm not going to enter into that debate because boy are there some amazing, dazzling, terrific dark dark books out there and they are important and transformative and worth reading and all that. "...these are supposed to be real life stories, about real life people. I’ve never come across an evil person. Have you? I write about what people really eat, and where they really live. I write about what people are really like, and in my experience most people are very kind to most people." 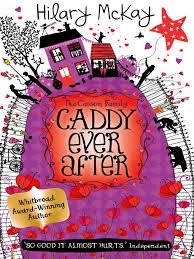 The Casson family novels consist of 'Saffy's Angel', 'Indigo's Star', 'Permanent Rose', 'Caddy Ever After', 'Forever Rose' and newish prequel 'Caddy's World' and follow the growing up years of a slightly ramshackle, bohemian and unashamedly eccentric family of artists, animal lovers and dreamers. They're a little bit unfashionably shabby posh but Hilary Mckay has a perfect ear for the universals of family dialogue and dynamics. I think she's particularly good at illuminating some of the trickier dynamics of friendships and school whilst keeping everything manageable and in context. Bullying features but her characters cope with it. Resiliance and humour in adversity is valued, nothing is made histrionic. Quite British in that respect I suppose. And mainly funny. Have I said how funny they are enough? I want to quote large chunks to show you this- but it's hard to pick a snippet or a line and this post is already unwieldy so instead I am going to take the UNPRECEDENTED step of directing you to Dread Amazon for their handy 'Look Inside' feature that will allow you to read the first few pages and then you will immediately want to buy them too. From your nearest Independent Bookshop natch. The Casson Family novels by Hilary Mckay, available in various different editions. Essential reading for dear friends who generally share my tastes...AND for Glaswegian bed dealers. Now Polly, you MUST read 'The Exiles' series. I am hopping up and down in excitement just recommending them. I love love love the Casson family and their sweet funniness and love - but the books that have made me cry with laughter are Hilary MacKay's 'Exiles' series. They are not better than the Casson family - they are different. In a way you have to forget the Casson family and come to the Exiles just as themselves - but they are so worth it! You are so LUCKY! I am looking forward to reading your post on them. 'The Exiles' are a big hit with my daughters because my 3 teenagers are very close in age, and Hilary MacKay is so accurate about the clear sighted and sometimes ruthless way sisters deal with each other - but also the invincible loyalty. I'm worried that they will be an anti climax after the Casson family. I lose all critical sense when talking about them. I suspect that the Casson family may be 'better' but I just don't know - because 'The Exiles' series has made me laugh so much - just thinking about some of the scenes make me happy right now. I can't think of a better accolade. I wish they were re-printed. My 17 year old daughter says more series like them should be available. I can't wait to swop favourite scenes with you!